Published on October 4, 2017 October 3, 2017 by Rachelle J. “Wednesday’s Words” is all about the quotes that inspire me or are relevant to my life in some way. When most people think about living life positively or constructively, I doubt the first person to come to mind for inspiration is Sylvia Plath. However, I’m more Emily than Pollyanna, and my brain tends to aim for the minor key when I want to find guidance for maneuvering through life’s obstacles. Right now, the major obstacle in my life is how to live as if I knew it were my last day. The idea was presented in yesterday’s Damn Early Days morning post and I’ve been thinking about it since. There was a question that Steve Jobs supposedly asked himself every morning: “If today were the last day of my life, would I want to do what I am about to do today?” He said that if the answer was “No” for too many mornings, he knew he had to change something. I asked myself the same question yesterday and my answer would definitely be “No” when it comes to my job. On both Monday and yesterday mornings I found myself feeling resentful of having to stop writing and get ready for work. I was especially annoyed at having to work overtime. While I may not be able to just up and quit the job that pays my bills, I can do quite a lot every morning about making sure I’m not stuck spending most of my time working in a job I don’t love. I can harness the energy behind that resentment and put it to work towards change. I can spend my free time doing what I love, instead of wasting it being grumpy. Though “Mad Girl’s Love Song” has nothing to do with meditation, this line makes me think about the session I did yesterday morning. It was a guided meditation titled “Creating an Extraordinary Day”. Several things Gael Chiarella said during that meditation gave me the same feeling Plath’s quote generates: “I am the Master of my life. I am courage in action. I have infinite creative power.” This goes back to how I spend my time. Obviously, I can’t blink my job into one that I love, but I can create small changes that eventually lead to me having work that makes me want to get out of bed in the morning, rather than hit the snooze button a million times. Image from clip of Youtube video. 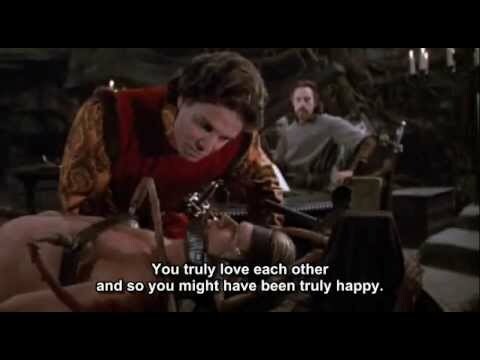 My original plan was to share the few favorite “love” quotes from various books I have copied down in my book journal, but then I remembered that I’ve never written a “Wednesday’s Words” about The Princess Bride by William Goldman. While these quotes aren’t all my favorites (there’s too many to list), they are my favorite love-related ones. You know me. I’m not big on Romance. When I get a book recommendation from someone who I know loves the kind of Fantasy that is more Romance than Adventure, this is the question, in the exact same tone, I want to ask. The confidence in this line is what gets me. Every once in a while, the Boyfriend says something about our relationship with that kind of assuredness. It makes me weak in the knees, and my stomach does that weird little flip thing. This quote reminds me of a scene in Gilmore Girls when Lorelai’s Father ends up in the hospital, and Emily demands that she gets to die before he does because she couldn’t handle losing him. I don’t believe in soul mates, but I do believe in the kind of love that when one of a couple passes away, the other can’t go on living. Published on December 23, 2015 December 22, 2015 by Rachelle J. This year has been rough. Just about everyone I know has suffered from loss, illness, or injury, and I’m not even going to get into world events. I’m also not going to preach about how we should all reach out and help or do some other good Samaritan activity. Instead, just be there. Be a part of your community, your family, your relationships. While I have always believed that those of us who can give a little something more during this time of year (and the rest of the year too) should do so, I also know that for many of us, just showing up and being present is all we’ve got. While we’re at it, let’s be there for ourselves as well. The Holidays don’t need to be full of activity to be *perfect*. Do you have ten minutes? Take five of those minutes and call a friend or a family member and tell them you love them. Take the other five minutes to breathe. I say all of this because while most people are talking about giving and doing and and and…they forget what the Holidays are about. I’ve been doing everything I can to avoid going anywhere this week. People are grumpy, and tempers are flaring in the stores, in the parking lots, and on the roads. Even store employees have attitudes, and it’s not hard to imagine why. I went to pick up the mail yesterday, and the mail woman was so shocked and happy when I wished her a Merry Christmas that I wondered how much time of her day is spent being largely ignored and unacknowledged unless someone wants something from her or something has gone wrong. So, forget about trying to rush around to do all the extraneous stuff that we’re all “supposed” to do this time of year, at least for ten minutes. Just be there; for yourself, and for your loved ones. If you think you can’t take that time, then tell everyone you’re going to church, or temple, or, if you’re Buddhist like me, to meditate. No one can argue with you about participating in religious or spiritual activities, especially not during the Holidays. We are all connected and have been since the first of us walked the earth, and this time of year has been special for various reasons to most civilizations down through the ages. So take ten, or more if you can spare it, and remember. I’ve been fascinated with Virginia Woolf ever since I watched the movie adaptation of The Hours by Michael Cunningham. I’ve read a large chunk of her work, my all time favorite being her essay “A Room of One’s Own”. Besides her most famous quote about Anonymous being a woman, it’s full of lines that are still relevant today. Someone, I think it was a college professor, once said that any resistance to the success of some “Other” stems from a fear of losing one’s sense of superiority. That “Other” has shifted throughout humanity’s history and has not always been defined by heterosexual, Christian, white men. However, speaking very generally, men around the world all the way up to present times have resisted the idea of women being equal to them regardless of any other factor (race, religion, etc.) Does the prevalence of misogyny throughout the world and time really come from a fear of upsetting some perceived hierarchy? If that’s what has always been behind the “reasoning” for why women (or anyone for that matter) can’t or shouldn’t do whatever they want, then it deserves being looked into further. This can be seen today when you look at the percentages of books with female main characters that win awards in comparison to the books with male main characters. Women’s Lit is considered to be fluff or brain candy. Stories about female friendships and familial or romantic relationships are seen as trivial or unimportant and not worth exploring if you’re a “serious” reader or writer. Putting personal reading preferences aside, why is it that a story about two male best friends is considered thought-provoking and meaningful, yet a similar story about two women is chalked up as just another piece of “chic lit”? I don’t force myself to read books that I have no interest in to add diversity to my reading life. I rarely ever read Literary Fiction. However, I also steer clear of the Bestsellers and award winners, and I try to find the Fantasy books that not everyone else is reading. While that doesn’t happen 100% of the time, I also look for books with a synopsis that doesn’t scream “trope filled sexist garbage”. As a result, I end up reading fairly diverse books. I read diversely enough that, for a long time, I didn’t understand why there is such a push for diversity in literature. Now I understand that I’m finding more diverse books precisely because of my resistance to jumping on the bestselling, award-winning bandwagon. Most of the books I read aren’t getting the attention of the mainstream media outlets, and they’re not displayed prominently on center tables in bookstores. Someday I would love to say that isn’t true. Until then, I’ll continue doing what I’m doing. My Russian History Class is really getting to me emotionally. The atrocities committed by the Soviets during WWII is staggering. There is so much focus on what the Nazis did, that there is often a failure to notice what the Soviets did, and it all makes me sick to my stomach, depressed, angry, and increasingly cynical. So, in an effort to make myself feel better, I’m dedicating this month’s Wednesday’s Words to Dr. Seuss. I’m sticking with books that don’t have anything to do with Russia right now, with the exception of my school work. Goodbye, War and Peace read-along. I’ve got tickets to everywhere, right on my bookshelf. When I chose my major, International Relations, it was because I wanted to work in Humanitarian Relief Aid, particularly with refugees, and my dream job was in the UNHCR. After working, very briefly, for a non-profit last Summer, I became disillusioned, and not quite sure if I really wanted to continue on my chosen career path. Later, I rediscovered my love of writing. It’s too late to change my major and I can’t afford a double major or even a minor. I also still feel an urge to do something related to Human Rights, and I still dream of going to grad school, but overall I don’t know what I’ll end up doing. I have faith that I will figure it out by the time I graduate, or I’ll at least be able to find a decent paying job in a field that I enjoy until I do figure it out. Until then, I’ll keep thinking and working, rinsing and repeating. However, I will always keep in mind that…. Wednesday’s Words is the replacement for Thursday’s Quotables. This line is so heartbreakingly beautiful I don’t have any other words. I think all women, and probably some men, have done this at one time or another. At least I know I have, especially when I was younger. I love Jo! I’m pretty sure she was my favorite of the girls when I was a kid as well. I don’t have a scribbling suit, or a room of my own (my desk is in the corner of the living room), and I’m not writing a novel, but I do go to a cafe with my notebook and sit for hours writing as if I have to get the words out of me or I’ll die. I started doing that during my teenage years, and though I stopped writing for a long time, I quickly went back to old habits when I started up again. Some of my favorite writers do the same thing, and knowing that makes me feel more a part of a community of sorts. This is the last Quotables of the year! If you love Fantasy, you probably love Harry Potter. It’s not a guarantee (I’m looking at you, Boyfriend. ), but chances are you do. I feel like the books are Winter books, so I decided to dedicate this Quotables to the Boy Who Lived and his friends. These two quotes, when put together (if you know the context, of course), show that following the rules isn’t always the right thing to do. That’s one of the many things I love about the Harry Potter books; the events and what Harry and friends do in response shows that it’s more important to think for yourself and do what your heart knows is right, rather than following along with what everyone else is doing. In an age when it’s so easy to find all the wrong information on the internet, this is becoming more and more true. This quote is the truth, especially when it comes to fuzzy socks. I don’t mind getting books, though.